Lightning potentially dangerous to people with deep brain stimulators. Credit: pexels.com. Creative Commons Zero (CC0) license. Patients receiving deep brain stimulation are warned that their neurostimulators (also known as implantable pulse generators, or IPGs) may dysfunction when confronted by electromagnetic fields that can be generated by particular electrical devices found at work, home, and in the hospital. A new and potentially dangerous source of dysfunction has been identified: nearby lightening. Slovenian neurologists describe a patient with neck dystonia whose IPG automatically shut off during a thunderstorm that destroyed some minor appliances in her apartment. For more details, see the article, "Lightning may pose a danger to patients receiving deep brain stimulation: case report, by Nea Prezelj, MD, Maja Trošt, MD, Ph.D., Dejan Georgiev, MD, Ph.D., and Dušan Flisar, MD, published today in the Journal of Neurosurgery. Deep brain stimulation (DBS) surgery is performed to treat a variety of movement disorders and some psychological disorders in select patients in whom medication alone is not enough to provide symptom relief. During surgery, one or more wires (known as leads) with electrodes on one end are inserted deep into the brain until the electrodes rest in the area(s) targeted for treatment. The leads are connected to an implantable pulse generator (IPG), a battery-operated micro-electronic device that is usually placed in the upper thoracic region, just under the muscle or patient's skin. The IPG delivers electrical stimulation to the brain sites where the electrodes are situated. This stimulation helps relieve patients' symptoms such as parkinsonism, tremor, and dystonia. IPGs have been likened to pacemakers for the brain, and like pacemakers they are subject to external interference from strong electromagnetic fields, which could cause them shut down, malfunction, and, in extreme cases, injure the brain. The authors describe the case of a woman equipped with a rechargeable IPG to relieve her symptoms of neck dystonia (involuntary muscle contraction). 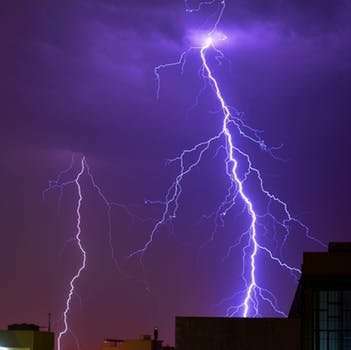 During a thunderstorm, lightning struck the electrical setup in the woman's apartment, burning and destroying the woman's television and air conditioner, which were operating at the time. An hour later, the woman noticed her dystonia symptoms had recurred. Fearing the IPG was damaged, the woman checked in with her clinic, where the IPG was found to require a reset. Fortunately, the IPG was unharmed. It had merely shut down as a response to the electromagnetic field generated by the lightning. After the IPG was switched back on, the woman's symptoms abated. The IPG used in this case (Medtronic Activa RC) must be regularly charged in the home. The unit consists of the IPG, a recharger, and an AC power cord. In fact, the battery of this particular IPG system can even be charged at the same time as the device's recharger by linking them in a chain to the power supply. The authors caution that such an action could potentially pose danger to the patient if done during a thunderstorm. Fortunately, the woman in this case was not charging her IPG during the thunderstorm, and the recharger was not connected to the electric power supply. Patients should immediately check the function of their IPGs if they experience an increase in symptoms, especially if there has been exposure to a strong electromagnetic field. A surge protector is recommended when plugging in an IPG recharger. For systems that allow charging the recharger and IPG at the same time, patients are advised to charge the recharger first and disconnect it from the power supply before using the recharger to charge the battery of the IPG. Clinicians should warn patients to strictly follow manufacturer's safety instructions on the use of the IPG. Manufacturers should add potential hazards of natural phenomena, such as thunderstorms, to their manuals and provide specific instructions on how the patient should act in such situations. When asked about the importance of the report, Dr. Flisar said, "Such an event has not yet been described. A thunderstorm is a common natural phenomenon; therefore, the present case draws attention to the potential danger of lightning strikes as well as possible measures to reduce risk and avoid this danger to the greatest extent possible in the future." More information: Prezelj N, Trošt M, Georgiev D, Flisar D: Lightning may pose a danger to patients receiving deep brain stimulation: case report. Journal of Neurosurgery, published online, ahead of print, May 1, 2018; DOI: 10.3171/2017.12.JNS172258.